Take the two words and write a Haiku. I use Haiku in English as my style, which is 5 syllables for the first line, 7 for the second, and three for the third, but you can use what you like. For syllable help visit HowManySyllables.com. Copy the link of your finished haiku URL in a comment so we can all go and visit your site to see what you have done. I will comment on your site. You can do a ping back. What’s a ping back? Put a link back to this prompt page, if you like within your post, as long as it does not take away from your haiku. 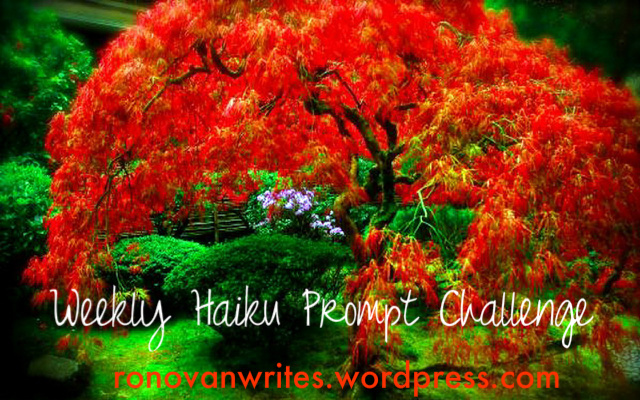 This is simply a prompt and challenge to encourage people to try Haiku and give some a prompt and a place to share in comments so we can find each other. A link in your post does give others a chance to find us and join in. Use one of the two below if you like. You may copy the badge/image appearing in this post and place it on your site if you wish, most normally use it within their post. I am not saying you need to, but if you would like to do so then go ahead. It is simply my way of saying thank you for participating. I sometimes make custom images for the week, if time and health permits. I hope they come True. Some believe in luck with every first star seen wish. With every first star seen wish, I hope they come true. Beautiful picture and great haiku! You are most welcome and I shall have the best week of my life thus far… 🙂 Wishing you the same or better. Beautiful example this week 😀 I’m going to have to let this one sit for a while! Thanks, as always, for the prompts. https://katemartynauthor.wordpress.com/2015/08/04/ronovan-writes-weekly-haiku-prompt-hope-luck/ I like your haiku, Ronovan, and thanks for a nice positive start to the day thinking on the prompt. hooray you are back on the net…..
Hardware issues are such a bother! Here’s to a crumbless future. Having spent the past five days doing tech support for my parents and their new laptop, I wish you luck. Cheers! Ruby, I thought your Haiku brilliant and felt a need to respond in form. What a lovely sentiment in your haiku! Somehow, luck and hope made me think of how ‘life is like a box of chocolates’….